Far away from the crowds of Mumbai is a small beach town situated on the coast of the Arabian sea, Murud – which is also popular for its grand Janjira fort. Murud is a sleepy fishing hamlet on the Konkan coast approximately 167 km from Mumbai. It’s 50 km from Alibaug and easily accessible by road. From Mumbai, we suggest the best way would be to take the ferry to Alibaug and then drive down to Murud (it’ll save you the bad roads and time). It’s a perfect weekend getaway for anyone looking for a quiet time by themselves away from the touristy crowd. 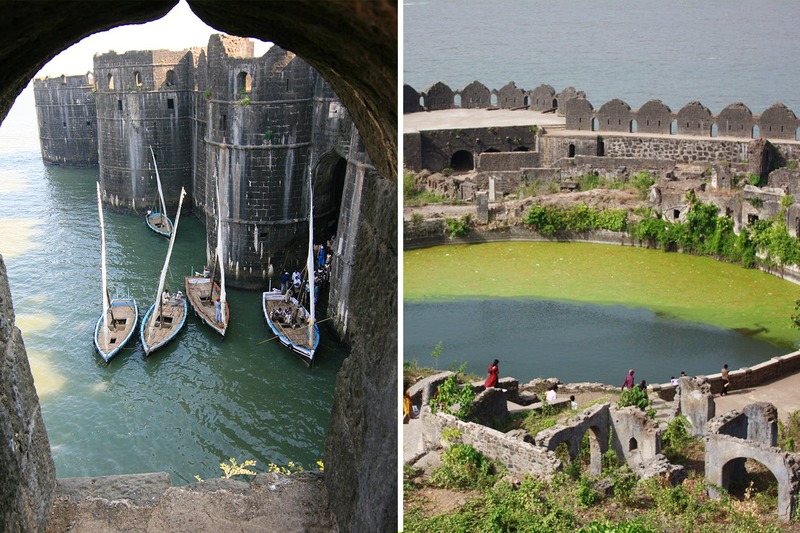 Get there to gorge on the locally cooked seafood, and explore the alluring, one-of-its kind fort bang in the middle of the sea – Janjira Fort built in the 15th century and occupied by the Siddis. The Fort is a 30-minute ride on the ferry from the Rajpuri Jetty that you can get to in an auto or a car. From there, every hour ferries ply to the fort and back. There is no entry fee to Janjira fort, however, the ferry ride will cost around INR 30-45 per person. Janjira Fort has a gorgeous view of the sea and the Murud beach can be seen on the horizon. Be warned, as is the case with most of the forts in this country, it’s dilapidated in parts too, but its rich history is worth a visit – with at least 20 bastions still present in the Fort. There’s plenty to do in and around Murud. If you’re looking to explore more, you can make a quick trip to Phansad Wildlife Sanctuary and the Koralia Fort (both accessible by road). There are a lot of car rental options, or if you’re in the mood for some physical activity, just stop by a bicycle rental shop. Rent a bicycle because the town can easily be explored on two wheels. The Murud beach is a lively spot and offers some spectacular sunset/sunrise views (and definitely one of the cleaner beaches around). As for staying options, we recommend a luxurious resort in Murud, Golden Swan Beach Resort. Apart from this, there are a lot of local lodges and resorts in Murud – done up by the locals themselves which are super affordable. Most of the restaurants in Murud serve freshly caught fish, so if you’re into seafood you’re in the right town. The local market also has a diverse collection of locally made spices and pappad, which we suggest you stock up on for your trip back home. Try something new and skip the regular holiday destination to discover this hidden gem in Raigad. It’s in a tranquil location, the locals are really friendly and one can easily plan it over the weekend. The best season to visit starts post monsoon as advised by the locals, so we say – jet, set, go. Also, the boats are often operated by the locals themselves, so a heads up as they won’t provide you a life jacket.